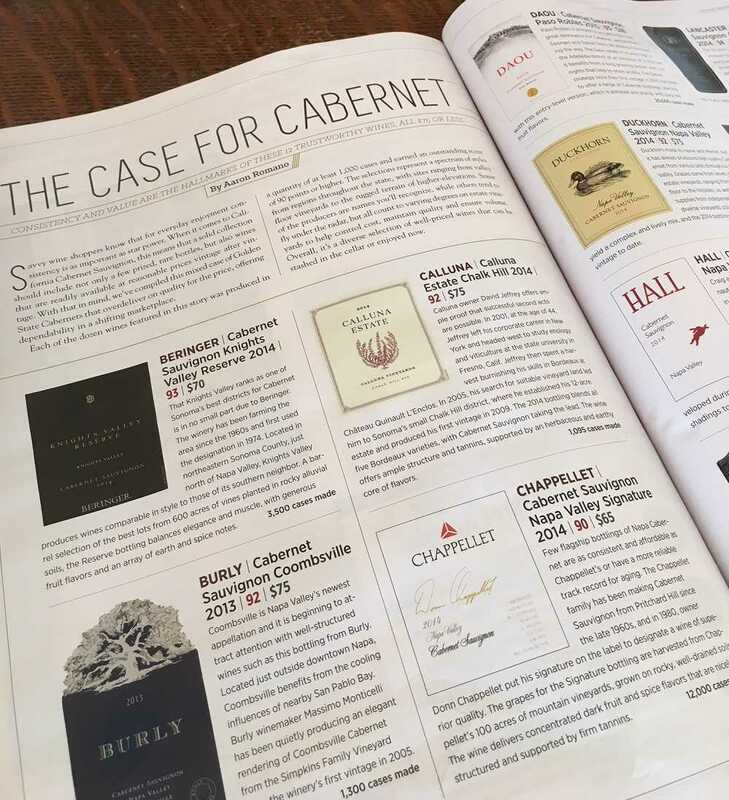 We are proud and honored to have been selected by Wine & Spirits Magazine as one of their Top 100 Wineries of 2015. 2010 Calluna Estate – This blend of 53% Cabernet Sauvignon, 20% Merlot, 17% Cabernet Franc and the rest Petit Verdot and Malbec from the relatively new Chalk Hill AVA is a winner. Its deep ruby/purple color is followed by aromas of floral-infused black currants and black cherries intermixed with hints of graphite and wet rocks. Medium to full-bodied and elegant yet authoritatively flavored, it builds incrementally on the palate. This classic proprietary red wine should age nicely for 10-15 years. It demonstrates what heights an intelligent Bordeaux blend can achieve in this AVA. Over in Sonoma, Calluna Vineyards’ 2010s certainly demonstrate that it remains possible to make low octane, stunning cabernet-based wines these days and one does not have to be part of the Woodstock Generation to have learned how to make great, restrained and ageworthy cabernet-based wines in California. The 2010 Calluna Vineyard Cuvée is comprised of a blend of forty-four percent merlot, thirty-six percent cabernet sauvignon, nine percent cabernet franc, six percent malbec and five percent petit verdot and comes in at a cool and classy 14.1 percent alcohol. The 2010 was raised in forty percent new wood. The wine is really quite lovely, showing a very complex, “cool fruit” nose of cassis, black cherries, tobacco leaf, lovely soil tones, a touch of violet and a very judicious base of new wood. On the palate the wine is pure, full-bodied and nicely structured, with a fine core of fruit, impeccable focus and balance, fine-grained, but fairly substantial tannins and excellent length and grip on the young and very classy finish. This is going to be a terrific wine and should age very gracefully indeed. Impressive juice for the cellar! 2020-2050. Calluna Vineyards is a relatively new project started by proprietor and winemaker David Jeffrey, and his 2010 “aux Raynauds” Merlot is quite a lovely example of just how serious this varietal can be in the right hands. This is a blend of eighty-three percent merlot and seventeen percent cabernet franc. David spent some time working on the Right Bank in Bordeaux prior to starting Calluna Vineyards and these sensibilities show here in the lovey nose of cherries, raspberries, cocoa, a touch of fresh herbs and tobacco and spicy new oak. On the palate the wine is deep, full-bodied and nicely light on its feet (reflecting is very measured 14.2 percent alcohol), with a good core, lovely focus and a fair bit of tannin to resolve on the long, nascently complex and classy finish. This is a grown-up’s bottle of merlot that will need some time in the cellar to blossom, but it is quite well-balanced and should be lovely with five or six years of bottle age. These are still young vines (having only been planted in 2005), and though the wine was raised in only twenty-five percent new wood, it might be a candidate for the next few vintages for all used barrels for the elevage. Good juice. 2018-2035. The Colonel’s Vineyard block of cabernet at Calluna Vineyards is located at the top of this Chalk Hill property and benefits from the cooler microclimate found in this corner of Sonoma. Though the vines are still young (having been planted in 2005), David Jeffrey has obviously done a fine job in restraining their vigor and has produced a wine with plenty of depth and intensity in the very elegant and adult style of Calluna’s wines. The bouquet on the 2010 Colonel’s Vineyard cabernet is a superb blend of black cherries, sweet cassis, tobacco smoke, gentle herb tones, a superb base of soil and a fairly generous dose of well-done new oak. On the palate the wine is deep, full-bodied and very svelte, with a lovely core of fruit, excellent focus and balance, plenty of ripe, youthful tannins and excellent length and grip on the classy and soil-driven finish. This is a chewy young wine that will need plenty of bottle age to allow the tannins to fall away, but its inherent elegance are already very much in evidence and this will be a lovely wine in the fullness of time. Like the estate’s merlot, I would love to see even less new wood used here, as the vines are still young and it seems to me that even more terroir would show here with less new wood and there is no good reason not to re-use the barrels that this wine was raised in for a few more years! This is very fine juice that reminds me stylistically very much of the beautiful wines of Cathy Corison, with the differences of terroir between the Rutherford Bench and Chalk Hill of course, very much in evidence. A lovely young wine. 2021-2050. The Calluna Estate bottling is the flagship wine from Calluna Vineyards, with the 2010 version made up of a blend of fifty-three percent cabernet sauvignon, twenty percent merlot, seventeen percent cabernet franc, eight percent petit verdot and two percent malbec. It was raised in a bit more new wood than the Calluna Vineyard Cuvée in this vintage, with sixty percent of the barrels new and the wine is just a touch riper at 14.3 percent alcohol. The 2010 Calluna Estate delivers and excellent nose of cassis, black cherries, cigar smoke, a fine base of dark soil tones, espresso, a bit of lead pencil and a judicious framing of cedary new wood. On the palate the wine is deep, full-bodied and seamless, with a young and very classy personality, a fine core of fruit, firm, well integrated tannins and excellent length and grip on the bright and still very primary finish. I love the sense of inherent balance and restraint on this young, elegant and very complex wine, and it should be a cellar treasure in the fullness of time. This is a very high class bottle of Bordeaux-inspired Sonoma red wine that will need at least another decade to really start to come into its own, but which should firmly cement the reputation of Calluna Estate as one of the brightest new producers in the firmament of California wine. Fine, fine juice! 2023-2050+. 2009 Calluna Estate – Exhibits a tight, complex mix of cedar, dried currant and crushed rock flavors, ending with firm tannins. The aromas are pure and enticing.